Windhoek, 2 December—The Committee for the safeguarding of intangible cultural heritage meeting in Namibia until 4 December inscribed today 20 new elements on the Representative List of the Intangible Cultural Heritage of Humanity. The Representative List includes forms of expression that testify to the diversity of the intangible heritage and raise awareness of its importance. The review of nominations for inscription on this list is finished for this year, which saw 23 elements inscribed out of a total of 35 that were proposed. Classical horsemanship at the Spanish Riding School Vienna is the traditional art and practice of breeding, raising, training and riding Lipizzaner horses. The School’s social practices, ceremonies and rituals reflect the relationships of long standing between breeders, grooms, craftspeople, riders and horses. Knowledge of horse husbandry and use of equipment is transmitted to cadets by grooms and experienced riders. The tradition gives communities within the School a sense of identity and ensures the safeguarding of techniques relating to horse husbandry. Copper craftsmanship of Lahij is the traditional practice of making and using copperware in the Lahij community of the Caucasus. The copper-smelting master prepares the copper then the coppersmith-hammerer moulds it into thin plates. A craftsperson engraves the plates with designs that represent their environment and reflect traditional knowledge and values. People from Azerbaijan buy the copperware for daily use. The practice is transmitted from father to son and said to be a clear marker of Lahij identity. The Surova folk feast, held in villages of the Pernik region, takes place on 13 and 14 January to celebrate the New Year. At night, a masquerade group called the Survakari performs in the centre, featuring characters like the newly-weds, the priest and the bear who visit homes the next day to ‘marry’ young couples and ‘maul’ people for good health. A meal is offered and donations collected for the needy. All ages participate, particularly young people, building their self-esteem. Tugging rituals and games in the rice-farming cultures of East Asia and Southeast Asia are enacted among communities to ensure abundant harvests and prosperity. They mark the start of the agricultural cycle and often begin with commemorative rites to local deities. Typically held near a communal house or shrine, two teams on either end of a rope try to tug it from the other. The practice is non-competitive, strengthening community solidarity and identity. Elders lead young people and the rituals. Marimba music and traditional chants and dances are considered integral to the community fabric of people of African descent in the Colombian South Pacific region and Esmeraldas Province of Ecuador. The music is played on the xylophone, drums and maracas and the chanted stories and poems are accompanied by dance performed at ritual, religious and festive events to celebrate life, worship saints or bid farewell to the deceased. The community is the bearer and practitioner of these expressions enhancing group identity and belonging. Marimba was first inscribed by Colombia in 2010 and is now extended to include Ecuador complementing the previous inscription. Kimchi is a dish made with various vegetables, including wild greens, as well as spices, fruit, meat, fish or fermented seafood before undergoing lactic fermentation. It is served for daily meals and special occasions. Although differences in climatic conditions and preferences result in variations in recipes, kimchi-making is a custom nationwide. Bearers and practitioners of the element are mainly women. However, when preparing large quantities for winter, family members, neighbours or other members of the community contribute enhancing social cohesion. Fichee-Chambalaalla is a New Year festival celebrated by the Sidama people. It is named after a woman who every year would bring her relatives a dish to share with the neighbours. Nowadays, children visit their neighbours who serve them the dish buurisame, made with false banana. The festival includes other communal events, concluding with clan leaders reminding the community about virtues like working hard. Transmitted by families and participation in the festival, the practice encourages peaceful co-existence and good governance. The art of marble-carving is an expression of the cultural identity of Tinos. Marble craftspeople possess empirical knowledge about the structure and properties of marble bearing rock. Transmission follows longstanding traditions where skills are passed on from master to apprentice, usually family members of the same family. Traditional motifs are mainly religious or apotropaic in nature often depicting cypresses, flowers, birds and ships and placed on buildings, churches and cemeteries. Designs for standard marble vessels and fanlights are used to bring fertility and prosperity. Traditional Balinese dances, performed by men and women, consist of three categories – sacred, semi-sacred and that meant for enjoyment by communities at large. Symbolizing particular traditions, customs and religious values, the dances consist of various movements and facial expressions to music played on the gamelan. The performers, who wear brightly coloured costumes with floral and faunal motifs, need to be disciplined, humble, charismatic and inject spiritual energy into the performances. The dances are mainly transmitted informally to groups of children. Aitysh/Aitys is a contest between two people on poetry improvisation spoken or sung to music of traditional instruments like the Kazakh dombra. The audience chooses the topics and the contestant who demonstrates the best musical skills, rhythm, originality and wit wins. Aitysh/Aitys is a popular cultural component and identity marker of bearer communities in multi-ethnic societies of Kyrgyzstan and Kazakhstan, featuring at local festivities or nationwide events often to raise important social issues. Transmission is from older to younger generations. The Oshituthi shomagongo, marula fruit festival, runs for two to three days between March and April when eight Aawambo communities from northern Namibia meet to enjoy omagongo – a beverage made from the fruit. To prepare, men carve utensils and serving tools and the women make basketsa and pots. They gather the fruit with young people, to process and ferment its juice. Traditional songs are sung, poems recited and lives discussed. Transmitted through observation and participation, the element unites generations and communities. The Wititi dance of the Colca Valley is a folk dance associated with the beginning of adult life. Typically performed by young people at religious festivities during the rainy season, it features couples in traditional costume dancing in rows to music by a band. Coinciding with the start of the agricultural cycle, the dance symbolizes renewal of nature and society. Competitions between villages renew the practice while strengthening social ties and cultural identity. Transmission occurs at school and in family gatherings. Lad’s dances are a genre of men’s folk dance in Romania practised on festive occasions and as stage performances. One of the dance leaders trains the group, while the second leads the dance. Participants can be aged 5 to 70 and include Hungarian and Roma dancers, as well as Romanian dancers, contributing to intercultural dialogue and social cohesion. The dance helps young men to strengthen their status in traditional communities, particularly among girls and their families in anticipation of marriage. Alardah is a traditional cultural expression combining dance, drumming and poetry chanting that is considered fundamental to practising communities. It involves a poet chanting verses, which are then sung by other performers carrying swords and moving in time to beating drums. Featured at family, local and national events, it is performed by males while women design the costumes. Neither age nor class acts as a barrier to participation, assisting social cohesion. Practice transmitters are individuals, schools, troupes, neighbourhoods and provinces. Bagpipe culture exists throughout Slovakia, covering instrument-making, music repertoire, style and ornamentation to dance, special verbal expressions and folk customs. Many attributes are hallmarks of the country’s traditional folk culture that include links to the environment, such as the natural material used for instrument making. Communities are proud to have a bagpipe player perform at local events as the music invokes a sense of identity for the public. Skills are transmitted within families and communities through formal and non-formal training. The epic art of Gorogly is an oral performing tradition that describes the achievements of legendary hero Gorogly and his 40 cavalrymen. Practitioners are performers in Turkmenistan who specialize in the epic, which incorporates narration, singing, poetry, vocal improvisation and music. It gives bearer communities a strong sense of identity, reflecting aspirations of the Turkmen people for a happy life and promoting values such as bravery, honesty, friendship, and fairness. Masters combine informal teaching with skills transmission during public performances. Al-Razfa is a traditional performing art of the United Arab Emirates and Sultanate of Oman that was initially used in victory celebrations. Now, it is a popular form of communal entertainment seen at festive events, involving groups of men holding wooden replica rifles chanting verses, often featuring traditional Nabati poetry, to music. 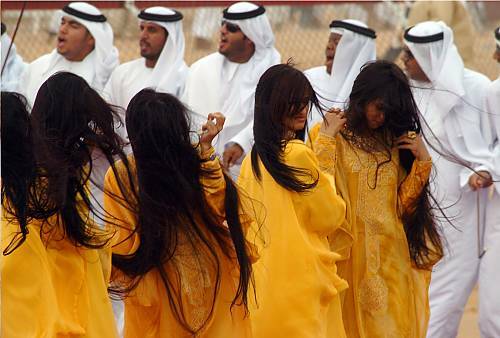 Sometimes girls participate by swinging their hair to the music. To appeal to a younger audience, instruments and music have been adapted. Skills transmission is informal within families. Serving Arabic coffee is an important aspect of hospitality in Arab societies. Traditionally prepared in front of house guests by men and women, it is also served by sheikhs and heads of tribes. The beans are roasted, ground with a mortar and pestle then brewed in a pot. The most important or oldest guest is served first. The practice is passed on within families and includes young people visiting the market with their elders to learn how to select beans. Majlis (sitting places) are community spaces where people discuss local issues, settle disputes, exchange news and be entertained, playing an important role in the transmission of oral heritage. The areas are usually large, comfortable and equipped with beverage-making facilities. Elders with extensive local knowledge are the main practice bearers, while judges and religious sheikhs adjudicate on disputes. Women have their own Majlis, although prominent figures may attend others more academic. Practice transmission occurs when children attend with older community members. Traditional knowledge and technologies related to the growing and processing of curagua play a significant role in moulding community identity in the municipality of Aguasay. Due to the strength this requires, men extract and process the plant fibre, which is used by women to weave artisanal goods like the hammocks, traditional emblems of the region. Promoting cooperation and helping to overcome ethnic, sociocultural, and gender barriers as women are considered important income providers, transmission is mainly within families through oral tradition.